Former two-division world champion “The Hawaiian Punch” Brian Viloria (34-4, 20 KOs) took out Jose Alfredo Zuniga (11-6-1, 5 KOs) in round five with a beautiful left hook to the body. Time was 1:42. 2012 Olympic light heavyweight gold medalist Egor Mekhontsev (4-0, 4 KOs) scored an impressive third round stoppage over Mike Mirafuente (2-1, 2 KOs). Mekhontsev dropped Mirafuente in round three and Mirafuente’s corner stopped the fight after the round. Unbeaten jr middleweight Kuok Kun Ng (5-0, 2 KOs) pounded out a six round unanimous decision over previously unbeaten Beau O’Brien (4-1-1, 1 KO). Scores were 59-55, 60-54, 60-54. Unbeaten lightweight Ik Yang (16-0, 11 KOs) scored a third round KO over Rachamongkol Sor Pleonchit (14-9, 6 KOs). Yang scored knockdowns in rounds one and three. Time was 1:40. Unbeaten super flyweight Rex Tso (14-0, 9 KOs) scored a fifth round TKO over John Bajawa (12-7, 6 KOs). The bout was stopped after Tso connected with a series of unanswered punches. Time was :48. In a bout cut from eight rounds to six rounds, super flyweight Mark Anthony Geraldo (31-4-3, 14 KOs) scored a unanimous decision over Efrain Perez (17-5, 12 KOs). Geraldo dropped Perez in round three and won by scores of 58-54, 58-54, 57-55. Top Rank Promotions put on a very successful pro boxing event at the Venetian Macao on July 19, 2014. 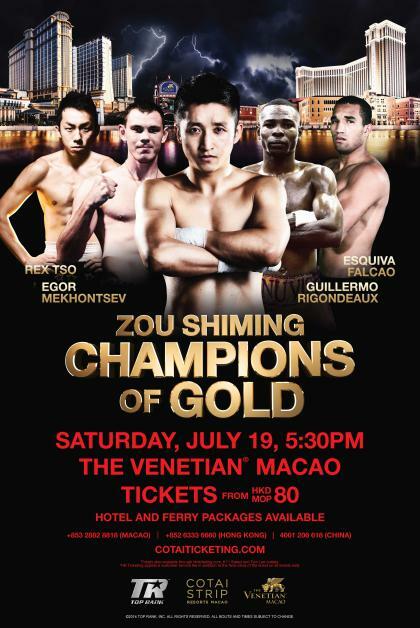 Zou Shiming was in the co main event (he defeated Luis De La Rosa). Guillermo Rigondeaux was in the main event (he defeated Sod Looknongyantoy). HBO boxing was happy to telecast the Zou Shiming fight on HBO2 and they’re also happy to see Bob Arum bring title boxing to China. There could be many more events held in China considering the success that Top Rank Promotions has had there.